In June–August 2016, a salvage excavation was conducted in Nahal Hevron, near Shoqet Junction (Permit No. A-7700; map ref. 190619–941/579321–585). 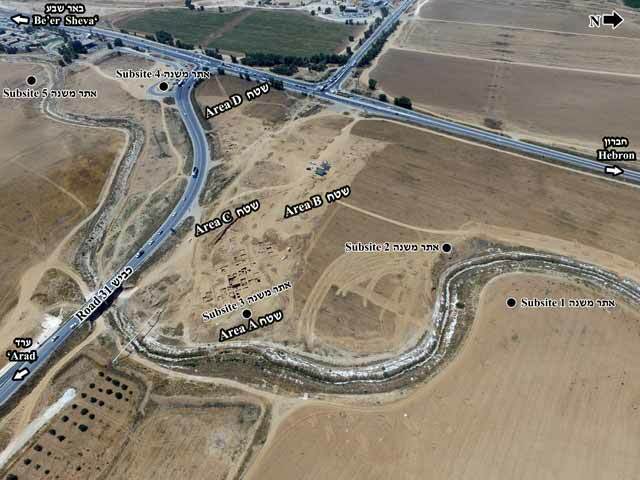 The excavation, undertaken on behalf of the Israel Antiquities Authority and financed by the Cross-Israel Highway Company, Ltd., was directed by R. Be’eri (photography), V. Lifshits, A. Fraiberg, M. Balila and I. Azoulay, with the assistance of A. Ziv-Ner, O. Eisenberg, H. Hamer, T. Abulafia and L. Talis (assistant area supervisors), Y. Al-ʽAmor (administration), M. Cohen, A. Hajian and Y. Shmidov (surveying and drafting), A. Peretz (photography), G. Fitoussi, E. Aladjem and Griffin Higher Photography LTD (aerial photography), Y. Raskin and G. Lopez (geoarchaeology), J. Regev and Y. Goren (14C analysis and microarchaeology), E. Ben-Yosef and Y. Vassal (magnetism), Y. Paz (ceramics), as well as Y. Vardi and Y. Abadi-Reiss (lithics). Additional assistance was rendered by P. Betzer, S. Talis and F. Sonntag. The site, which is divided into five secondary sites (1–5; Fig. 1), is located on the banks of Nahal Hevron (Wadi el-Khulil) in the Be’er Shevaʽ Valley. 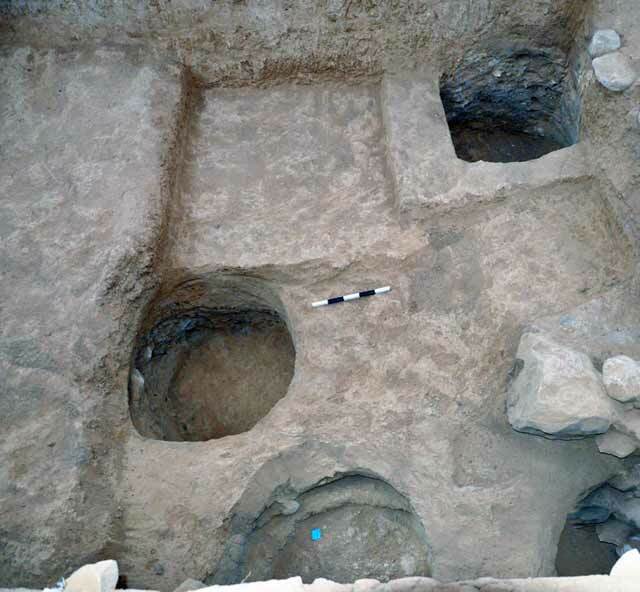 Surveys and excavations in the Be’er Shevaʽ Valley have led to the discovery of dozens of sites with a rich material culture from the late fifth millennium BCE. Most of the sites are found along the large streams that drain the valley, including Nahal Hevron, Nahal Be’er Shevaʽ and Nahal Gerar (Perrot 1955; Dothan 1958; Baumgarten and Eldar 1984; Levy 1986; Levy et al. 1991; Gilad, Rosen and Fabian 1991; Perrot 1993; Gilad 1995; Rowan and Golden 2009; Nahshoni 2010; Paz et al. 2014). The secondary sites of Nahal Hevron are spread along a loess plain on the banks of the stream, where fields of dryland farming were in use until fairly recently; the five secondary sites are delimited by the horseshoe-shaped bends of the streambed. 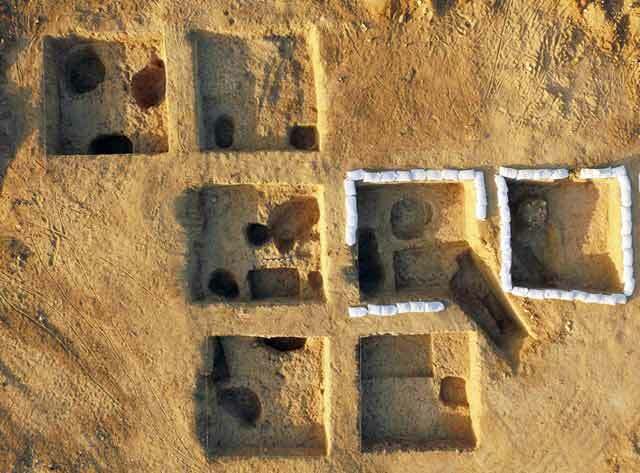 The sites, comprising remains of buildings and installations, were separated by areas devoid of archaeological remains, extending over dozens and even hundreds of meters. 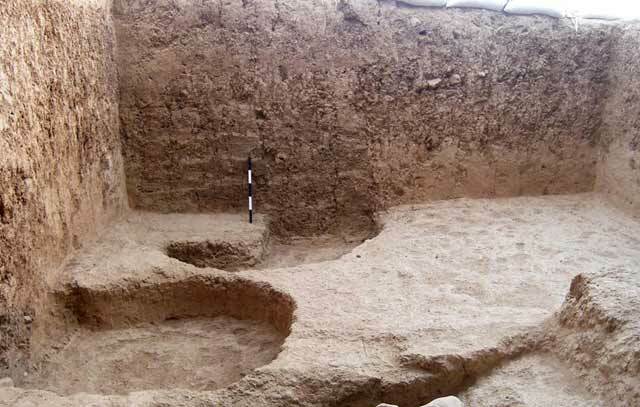 The excavation was conducted only in Secondary Sites 3 (Areas A–C) and 4 (Area D), where settlement remains from the Chalcolithic period (Ghassulian culture)—buildings, pits and four subterranean complexes—were unearthed. Secondary Site 4, c. 800 m southwest of Tel Shoqet, was excavated in 1984 (Govrin 1990). In the past, a well called Bir el-Makrûneh, which is marked on the British survey map, was discovered nearby. 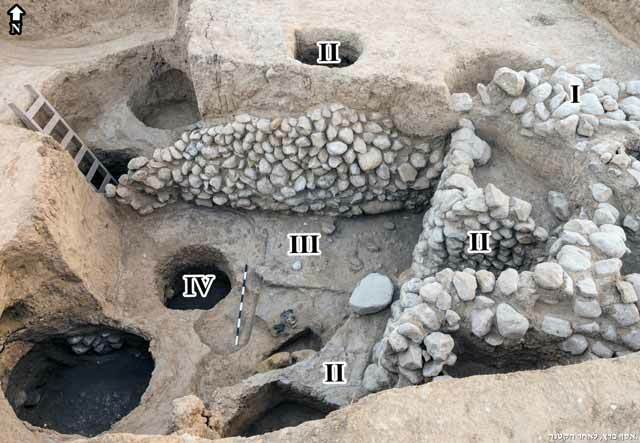 Three excavation areas were opened (A–C), in which four stratigraphic phases (IV–I) were identified. Area A (Figs. 2, 3). The earliest phase (IV) was exposed at a depth of 3–4 m. It comprised numerous cylindrical and bell-shaped pits (Figs. 4, 5). Several of the pits were excavated down to a level of stream pebbles, which served as a floor at the bottom of the pits. Pottery sherds, flint items and animal bones were found in the soil fill that was removed from the pits. 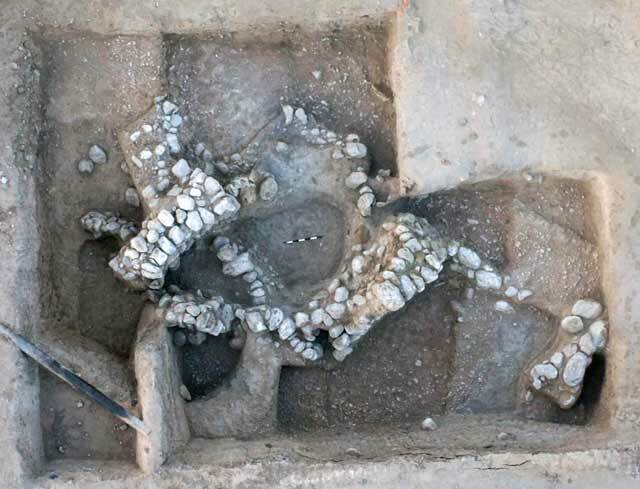 A concentration of shells that came from the Nile River and the Mediterranean Sea was found in one of the pits. In addition, many grain seeds were discovered in the pits, suggesting that they were used as silos. The Phase IV pits were filled in during Phase III. A large triangular gravestone, placed on its narrow side (Fig. 6), was discovered above one of the pits. Pebbles were deposited above most of the pits, and a floor of dark gray tamped earth was installed over them (see Figs. 3, 6). 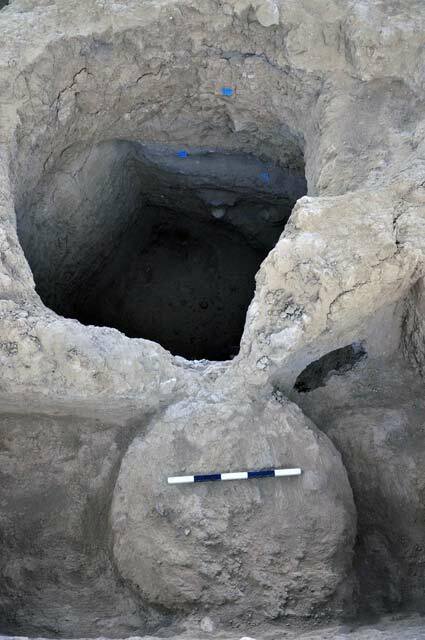 Several ash concentrations were exposed on the floor, and in situ cooking pots were found nearby (Fig. 7). 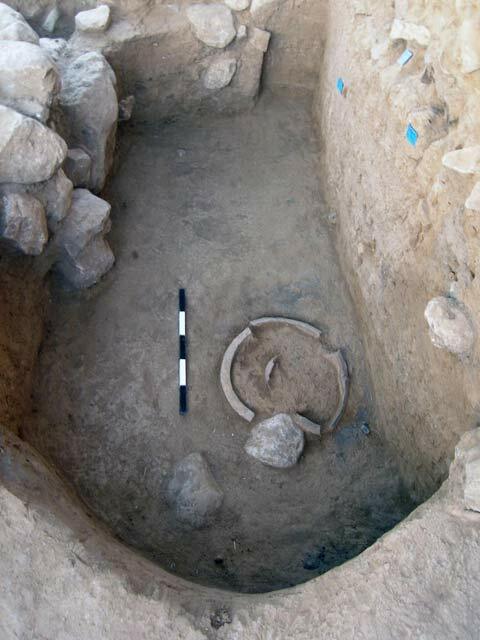 A large ceramic basin that contained a V-shaped bowl was discovered in situ (Fig. 8). The ash concentrations indicate that the floor constituted the surface level during this phase. An accumulation of fine-grained alluvium (thickness 1.8 m; Fig. 9), devoid of anthropogenic remains, was found above the floor. The source of this accumulation may have been a flooding of the stream, which led to the abandonment of the site. Layers of alluvium discovered in trial trenches opened between Areas B and D corroborate this assumption. 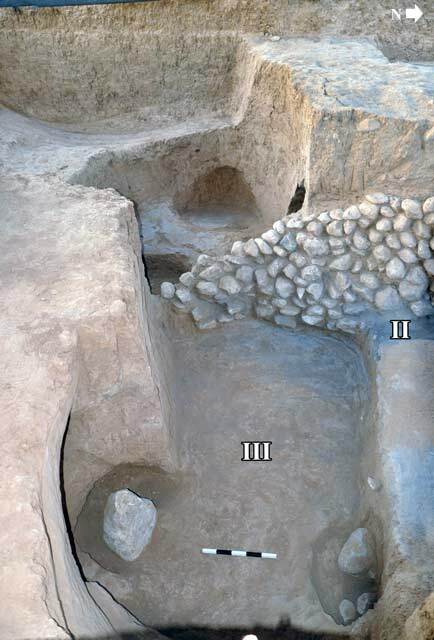 Most of the settlement remains exposed in the excavation belong to Phase II: four large subterranean complexes (Figs. 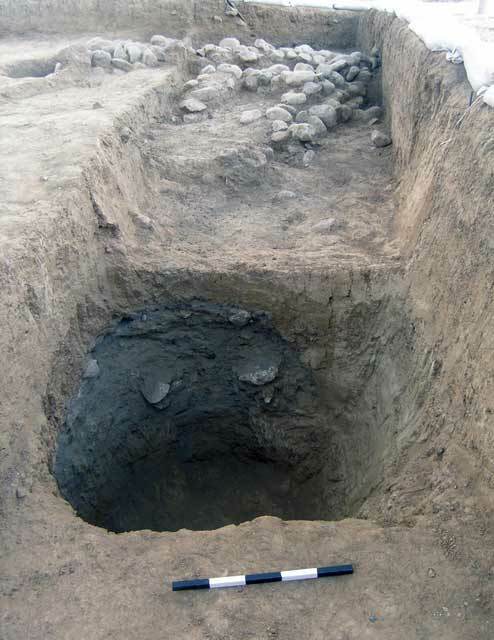 10, 11) and pits dug into the alluvium that covered the remains from Phase III. The subterranean complexes included cavities (max. size 7 × 8 m, max. depth 2.5 m), several of which were connected by horizontal or sloping tunnels (Fig. 12). The walls of some of the cavities were lined with mud-bricks or large pebbles brought from the streambed. Staircases descended from the surface down to the complexes (Fig. 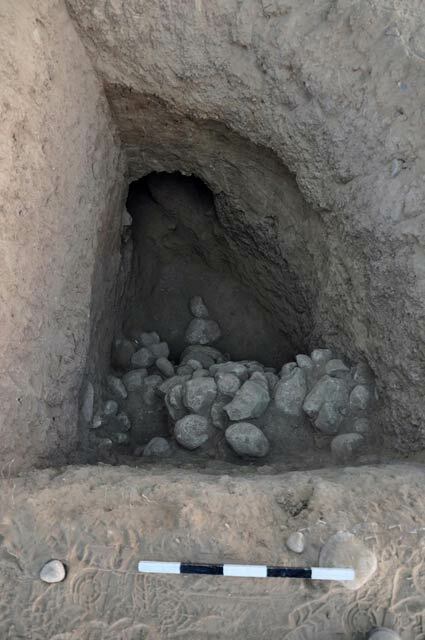 13); they were dug and at times lined with stones. A shaft for ventilation and lighting was discovered above some of the cavities (Figs. 14, 15). One of the complexes was damaged by the construction of Highway 31, and only its outline was preserved. Pottery fragments of storage vessels, cooking vessels and churns were discovered above the cavity floors. One of the complexes had a rectangular opening; a large grinding stone that served as a step was placed in front of it (Fig. 16). Large grinding stones, flint artifacts, including numerous sickle blades and bone items, were also found. 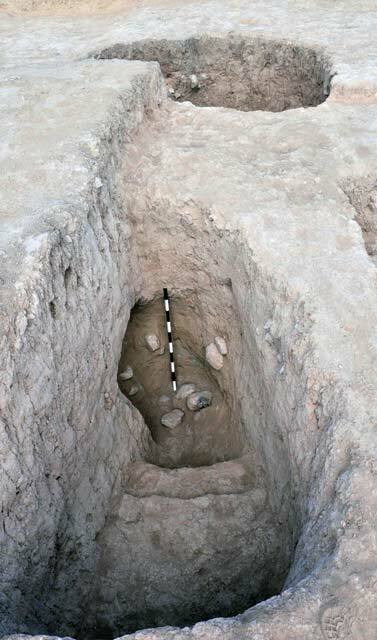 In addition to the subterranean complexes, many pits were discovered in this phase; some were large and several meters deep, and others were small and shallow (depth 0.5–1.0 m). The walls of a number of pits were lined with mud-bricks or large pebbles brought from the streambed (Figs. 17, 18). 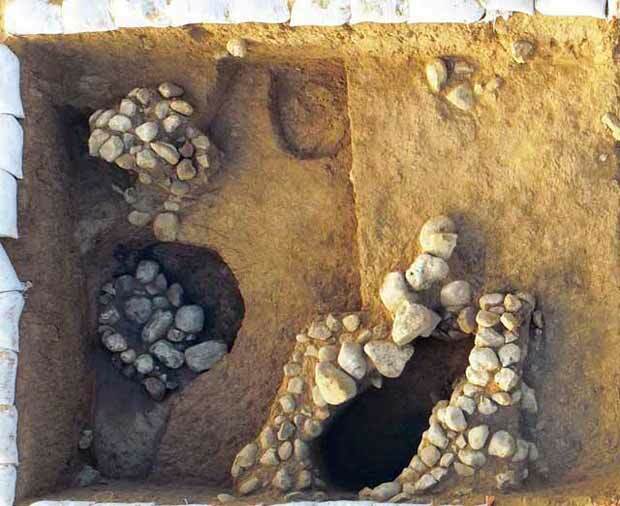 The soil fill excavated in some of the pits contained grains of wheat, barley and lentils, as well as olive pits. Two elliptical incineration pits filled with ash (diam. 1.4 m, depth 0.5 m) were also discovered. In Phase I, most of the subterranean complexes and pits of Phase II were filled with soil (Fig. 19). The finds revealed in this phase included phytoliths (amorphous silicate minerals formed in plants); spherulites (microscopic calcium carbonate produced in animal droppings); wheat and barley seeds; pottery sherds, mainly of V-shaped bowls and churns; flint items, including many sickle blades; two stone maceheads; and fragments of stone artifacts, including grinding and pounding tools. The soil fill in one of the large Phase II pits (diam. 2.5 m, depth 2.4 m; Fig. 20) contained flint items such as cores, bladelets and thousands of flakes—probably knapping debitage. Some of the flint items bore indications of thermal alterations, which are usually found on intentionally heated siliceous rocks. The soil fill in most of the pits was covered with pebble heaps that marked the location of the pits (Fig. 21, and see Figs. 11, 15, 16). Two horseshoe-shaped installations (Figs. 22, 23) were built above a few of the pits; their walls were built of large pebbles to a maximum height of two courses, and an opening was fixed in them. No finds were discovered inside the installations. A rectangular building (2 × 3 m; Fig. 24) was discovered in the southern part of the area. Its walls (width 1 m, preserved height 1.3 m), constructed of pebbles, were founded on the pits of Phase II and on a level of streambed pebbles. The southern part of the building was destroyed and covered with pebbles due to flooding of the stream. Area B (Fig. 25). A large, two room broad house (5 × 12 m) was exposed in Phase II. The walls of the structure (max. width 0.8 m) were built of mud-bricks and set on broad, flat foundations built of pebbles. An entrance to the building was fixed in the eastern wall. It consisted of a staircase built of three large flat stones, one of which was a grinding stone. The steps descended to the floor of the building, which was c. 0.8 m below the courtyard and surface level during that period. 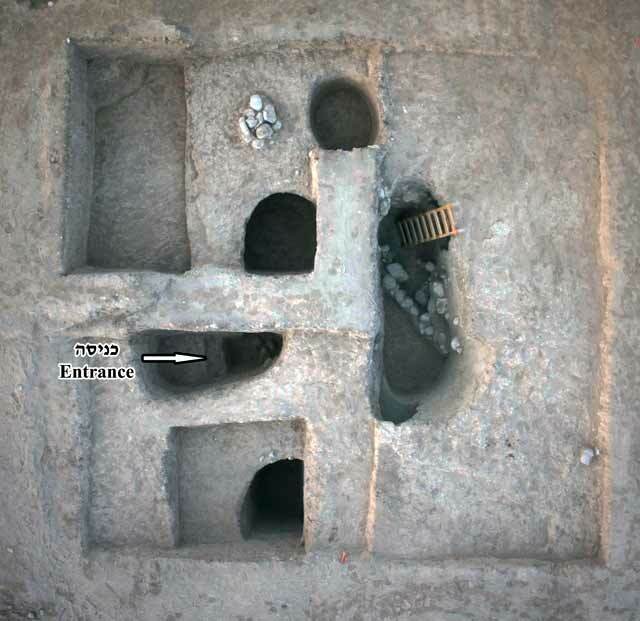 A pebble-lined shaft enclosed within two thick walls (thickness 1 m) was discovered next to the building’s western wall. The shaft led to a subterranean cavity, which was not excavated. An irregular-shaped courtyard, paved with small pebbles, was exposed next to the building, and two shallow pits were discovered near the courtyard. One of the pits, which was may have been used for firing pottery vessels, contained ash. Layers of ash, fragments of pottery vessels, stone artifacts and many flint items were found on the floors of the building. 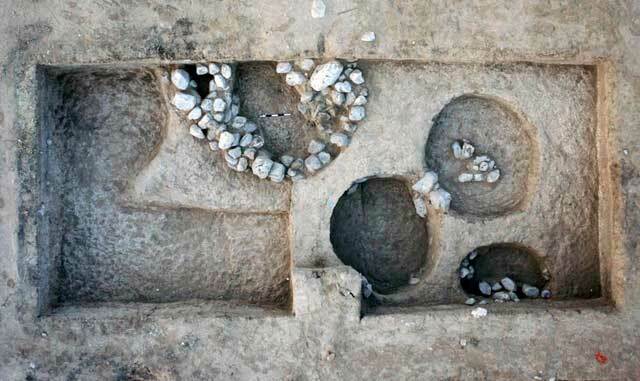 A concentration of spindle whorls—pebbles of various sizes perforated with through-holes—and a bone pendant were discovered on the floor of the southern room. A copper macehead was recovered from the soil that had accumulated in the courtyard. In Phase I, only the courtyard the building continued to be in used. Three elliptical pebble-built installations were constructed above the building. Also exposed were levels of tamped earth bearing numerous pottery sherds, indicating that these were habitation levels during this phase. Area C. Several trial squares were opened along a trench (depth 2–3 m) that Mekorot had dug for installing a water pipe. Pebble concentrations and finds from the Late Chalcolithic period were discovered in the lower part of the squares. The excavation in this area was not expanded due to the depth of the remains and because the area was not designated for development. The site extends along both sides of Road 31. One area (D; 250 sq m; Fig. 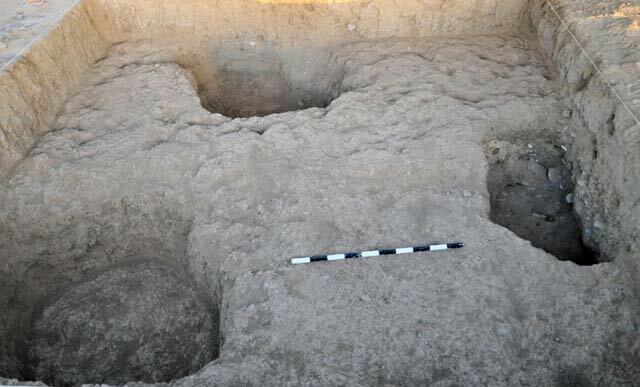 26) was opened east of the road, yielding remains of a single-phase settlement. Fifteen shallow pits (depth c. 0.5 m; Fig. 27) were revealed beneath the surface level (thickness 0.3–0.5 m). 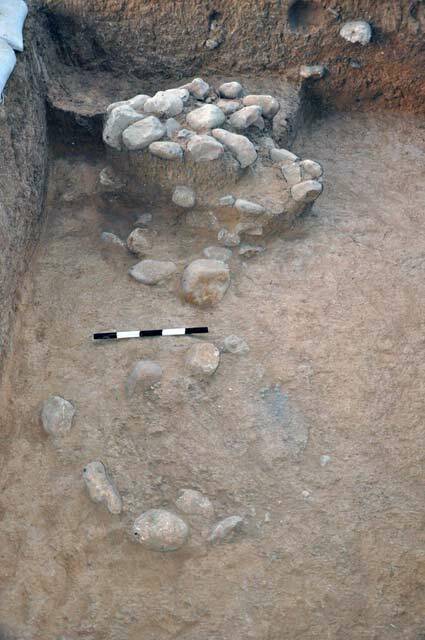 Some of the pits were intentionally blocked with organic material mixed with fragments of pottery vessels, including V-shaped bowls and churns, flint items, stone artifacts, loom weights and spindle whorls. Overlying the fill in some of the pits were clusters of pebbles, similar to the concentrations of pebble exposed in Phase I in Area A. A building discovered near the pits in the past (Govrin 1988); the pits may have been connected to the activity that took place in it. The two excavated secondary-sites, 3 and 4, differ from each other in the duration of activity that was conducted in them: Site 3 had four stratigraphic phases, indicating a long period of activity, whereas only one phase was revealed at Site 4. However, the similarity between the two sites—evident in the multitude of V-shaped bowls, churns and perforated pebbles along with the custom of marking the pits with river pebbles—indicates that they were contemporaneous, dating from the Late Chalcolithic period (Ghassulian culture). The subterranean complexes in Area A—with their mild and fixed temperature, unlike the arid climate prevailing in the Be’er Shevaʽ Valley—made the complexes fit for storage and some day-to-day activities. Pits, installations and tools exposed around the building in Area B allude to the daily household activities that took place there: processing food, churning milk, food storage, weaving and spinning. The multitude of finds discovered on the floors of the buildings—including species of grains and legumes and animal bones, alongside spinning implements, churns, sickle blades and crushing and grinding artifacts—indicate that the inhabitants of the site practiced a diverse, multi-year agriculture and husbandry, which included dryland farming, orchards and flocks. The olive pits indicate that either olive trees grew in the area or olives were brought in from the Hebron hill country. Finally, Secondary-Sites 3 and 4 should be added to the list of Late Chalcolithic (Ghassulian culture) sites already known in Nahal Be’er Shevaʽ, which include Khirbat Matar, Bir es-Safadi, Horbat Betar (Horbat Beter, Kh. el-Bitar), and Tel Shevaʽ (Perrot 1955; Dothan 1958; Baumgarten and Eldar 1984; Gilad, Rosen and Fabian 1991; Perrot 1993; Paz et al. 2014). Baumgarten Y. and Eldar I. 1984. Neve Noy — A Chalcolithic Site near Beer-Sheba. Qadmoniot 66–67:51–56 (Hebrew). Dothan M. 1958. 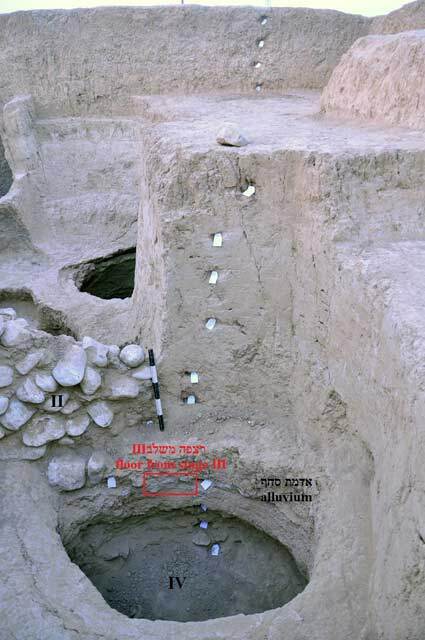 The Excavations at Horbat Betar (Be’er Sheva‘), ‘Atiqot (HS) 2:1–39 (Hebrew). Gilead I. 1995. 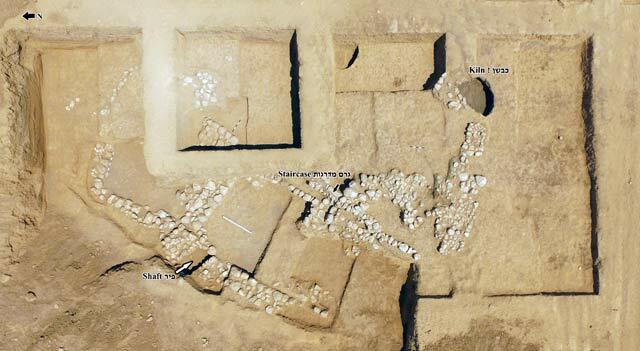 Grar: A Chalcolithic Site in the Northern Negev (Beer-Sheva VII). Be’er Sheva‘. Gilad I., Rosen S. and Fabian P. 1991. 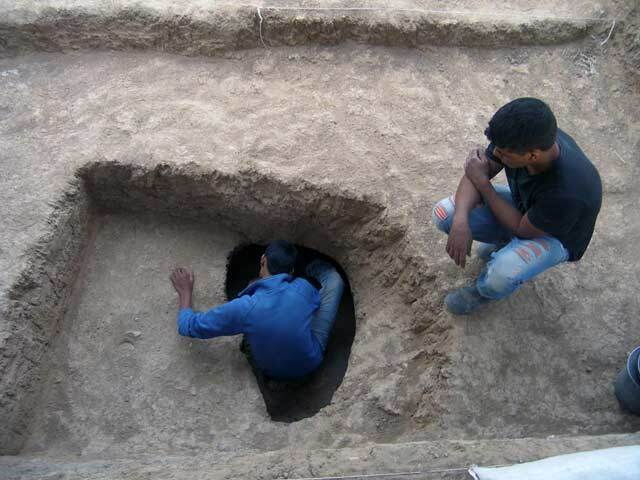 Excavations at Tell Abu-Matar (the Hatzerim Neighborhood), Beer Sheva. JIPS 24:173–179. Govrin Y. 1990. Somet Shoqet. ESI 7–8:173. Levy T. 1986. Archaeological Sources for the Study of Palestine: The ChalcolithicPeriod. BA 49:82–108. Levy T.E., Grison C., Buikstra J.E., Alon D., Smith P., Shalev S., Goldberg P., Holl A., Rosen S.A., Ben Itzhak S. and Ben Yosef A. 1991. Protohistoric Investigations at the Shiqmim Chalcolithic Village and Cemetery: Interim Report on the 1987 Season (BASOR Suppl. 27). Baltimore. Pp. 29–46. Nahshoni P. 2010. Nahal Pattish. HA-ESI 122. Paz Y., Aladjem E., Abadi-Reiss Y., Kahalani N. and Timmer N. 2014. Tel Sheva‘. HA-ESI 126. Perrot J. 1955. 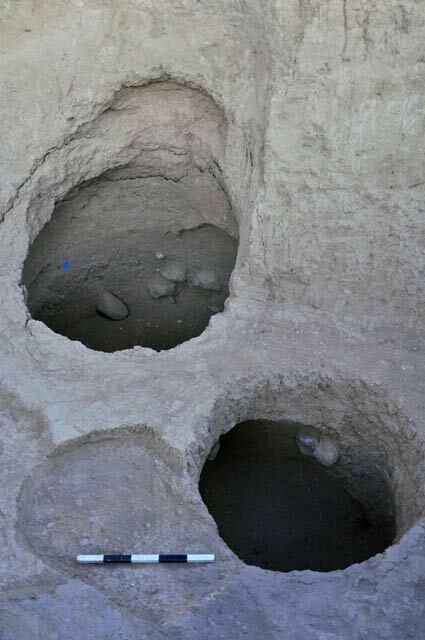 The Excavations at Tell Abu Matar, near Beersheba. IEJ 5:17–40. Perrot J. 1993. 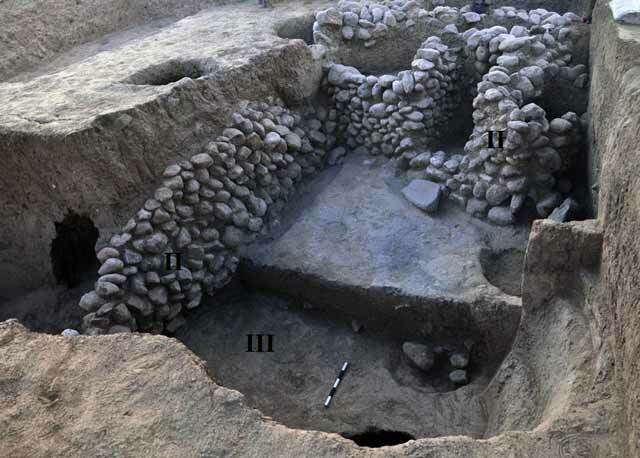 Beersheba: The chalcolithic Settlements. NEAEHL 1:161–163. Rowan Y.M. and Golden J. 2009. 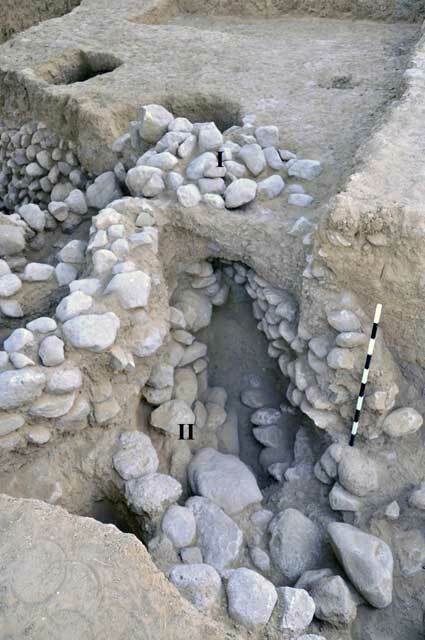 The Chalcolithic Period of the Southern Levant: A Synthetic Review. JWP 22:1–92. 2. Area A, view from above looking north. 3. Phases IV–I in Area A, looking north. 4. Area A, Phase IV pits, looking east. 5. Area A, Phase IV pits, looking west. 6. Area A, a Phase III triangular gravestone above a Phase IV pit (bottom left), looking north. 7. 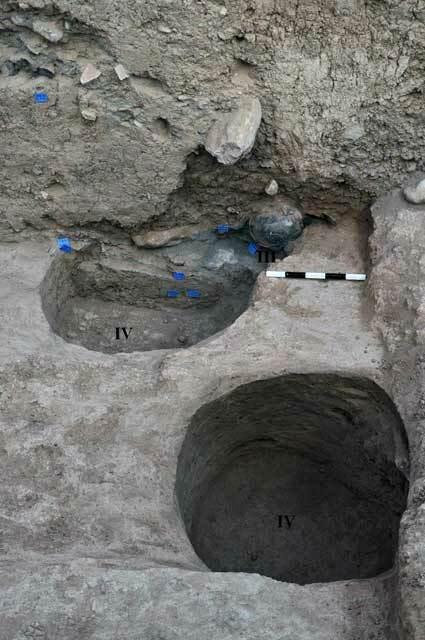 Area A, an in situ cooking pot above a Phase III concentration of ash, looking west. 8. Area A, an in situ Phase III ceramic basin, looking south. 9. Area A, an accumulation of fine-grain alluvium soil above a Phase III floor, looking south. 10. Area A, Phase II subterranean complexes, view from above looking north. 11. Area A, Phase II subterranean complexes and a Phase I pebble heap that blocked a pit (top), view from above looking south. 12. Area A, a tunnel connecting cavities in a Phase II subterranean complex, looking north. 13. Area A, a staircase leading to a Phase II subterranean complex, looking west. 14. Area A, a shaft above a in Phase II subterranean complex, looking west. 15. Area A, a shaft above a Phase II subterranean complex and a Phase I pebble heap that blocked another shaft, looking east. 16. Area A, a rectangular opening of one of the Phase II complexes and a grinding stone in front of it, looking northeast. 17. Area A, a Phase II pit, and a cluster of Phase I pebbles above it, looking northwest. 18. Area A, mud-brick lining (on the left side of the section) of a Phase II pit, looking north. 19. Area A, Phase I soil fill in a Phase II subterranean complex, looking west. 20. Area A, Phase I soil fill with flint artifacts in a Phase II pit, looking southwest. 21. Area A, Phase I pebble heaps above the soil fills in the pits, looking west. 22. Area A, a Phase I horseshoe-shaped installation, view from above looking south. 23. 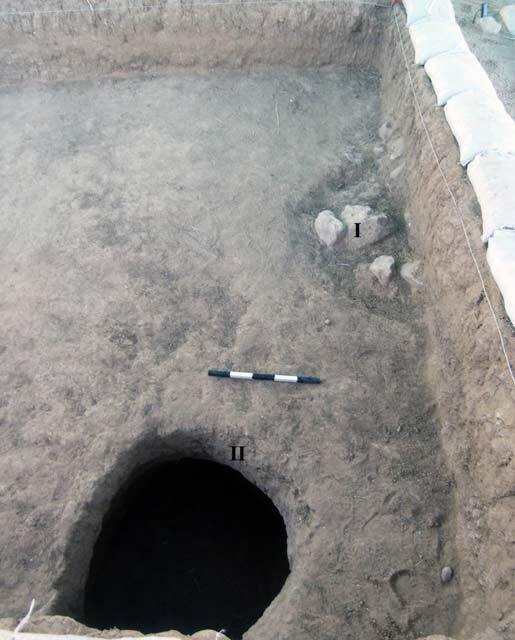 Area A, a horseshoe-shaped installation in Phase I and Phase II pits, looking south. 24. 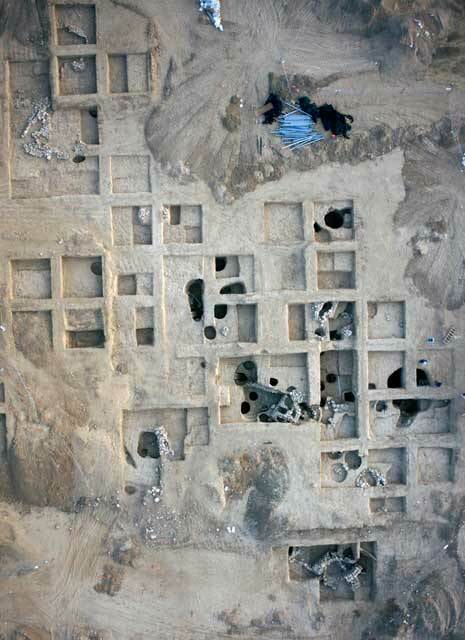 Area A, a rectangular building in Phase I, view from above looking south. 25. Area B, view from above looking east. 26. Area D, view from above looking west. 27. Area D, shallow pits, looking west.